I was looking for a new restaurant to visit just in time for a Mothers' Day celebration. 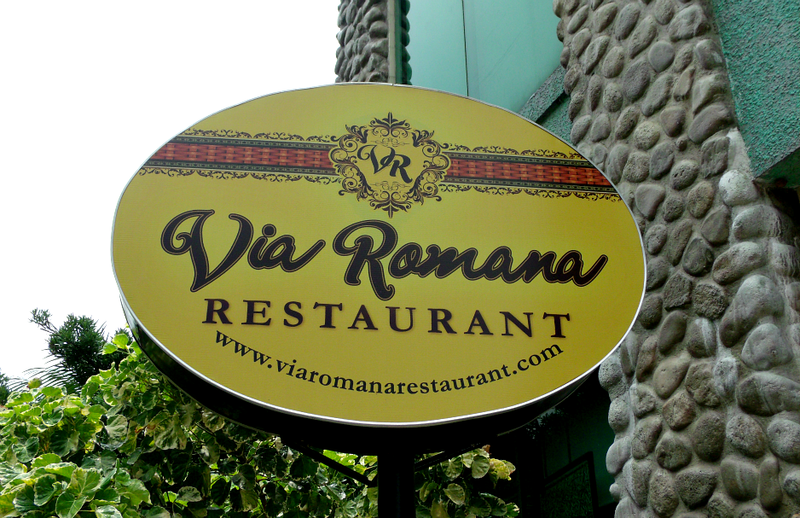 Luckily, I knew about Via Romana a few weeks before and told my parents and my brother to reserve their May 12th so we could eat out. 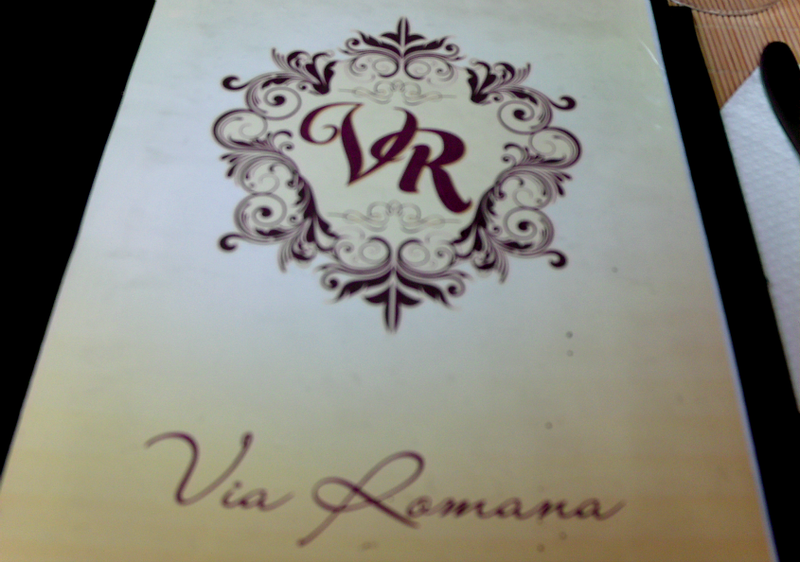 After looking at other options for our celebration, my mom chose to eat at Via Romana since the food looks delicious and it's nearer our place. I went straight home after work yesterday and arrived there past lunch time. Via Romana is located inside a compound called Paradiso Terrestre which is a huge events venue. 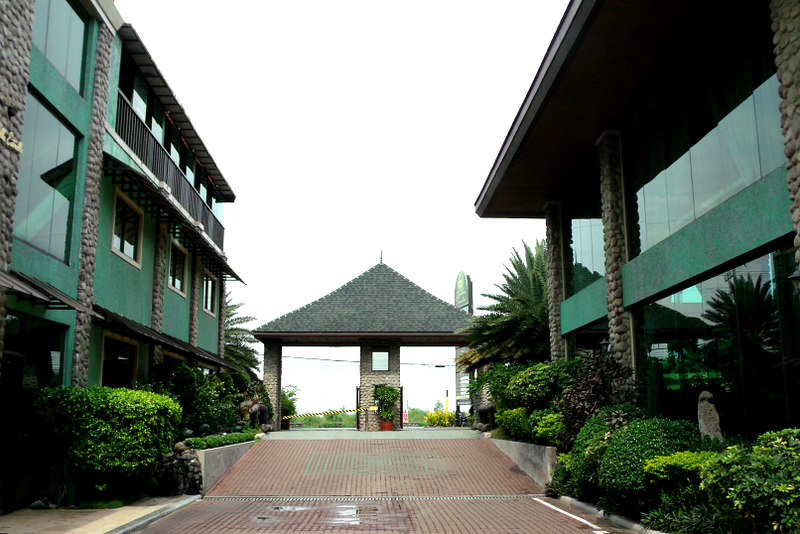 In here, you could also find different events spaces for all your needs: Cafe Nenita (the elegant space; the structure with glass walls on the right of the photo), Patio Verde Garden (more of a terrace, outdoor feel), Villa Estrella (for company conferences and private meetings), La Veranda (roof top events space), De Cor Azul (for swimming parties) and Cabana Jarden (a small garden venue for intimate gatherings). 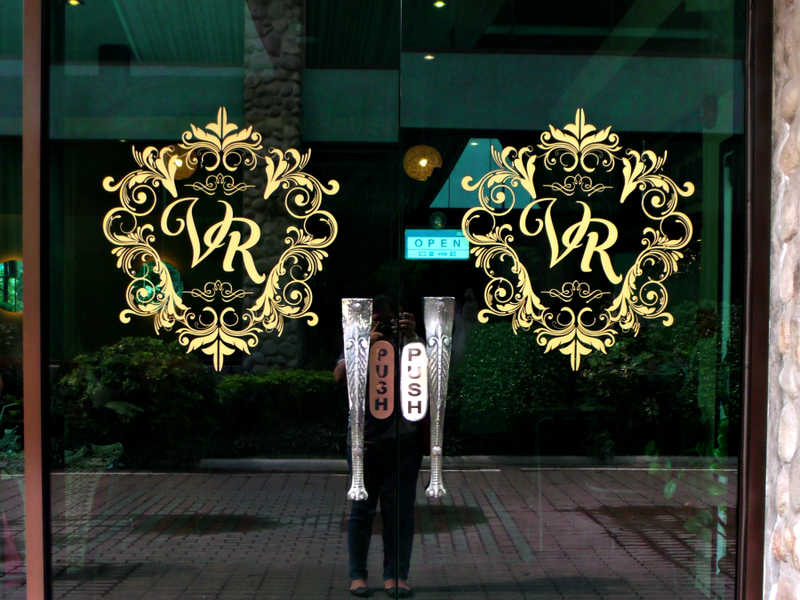 Other establishments include La Terraza Bar & Grille (for those parties with a splash of alcohol and loud karaoke music), La Vista Deck (if you're a romantic) and Cafe Paradiso (well, yes, a cafe). So basically, everything you need for a grand and well prepared event is here. Pretty neat, eh? The place is really cozy and modern at the same time. I really, really like the contrast of the different materials that they used in their furnishings. Warm tones were evident due to the native materials but the elegant vibe is there as well. We even called up a few days before to make a reservation because I was afraid the place would be too crowded when we get their. Apparently, not a lot of people know of this place yet. But one thing I noticed the entire duration of our lunch, the place may not be packed but it never ran out of customers. Click the arrow on the photo below to see more of the photos of Via Romana's interiors. And here's the fun part, our food! 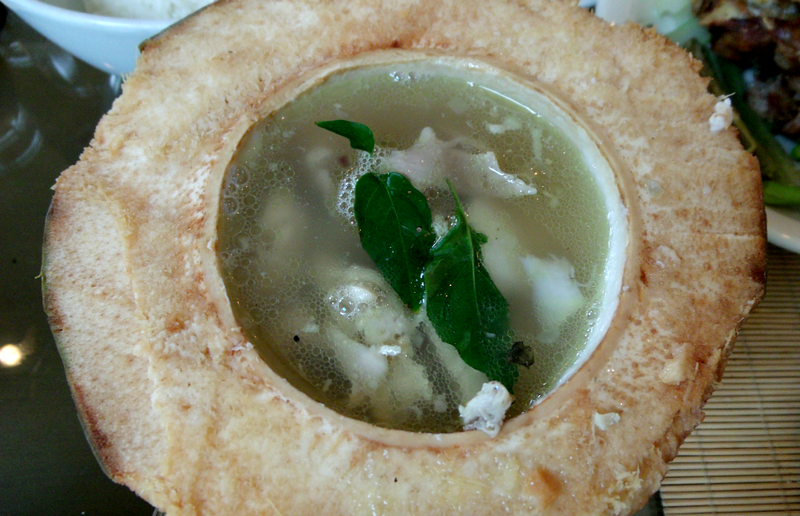 This is boiled chicken meat with strips of coconut flesh in a savory broth, served in a halved coconut shell. One serving's only good for two as the coconut shell is not that hollow as you may think. Hehe. My parents really liked this because of the refreshing quality of the balance of sweet and salty. The coconut strips are such a delicious twist to this soup. 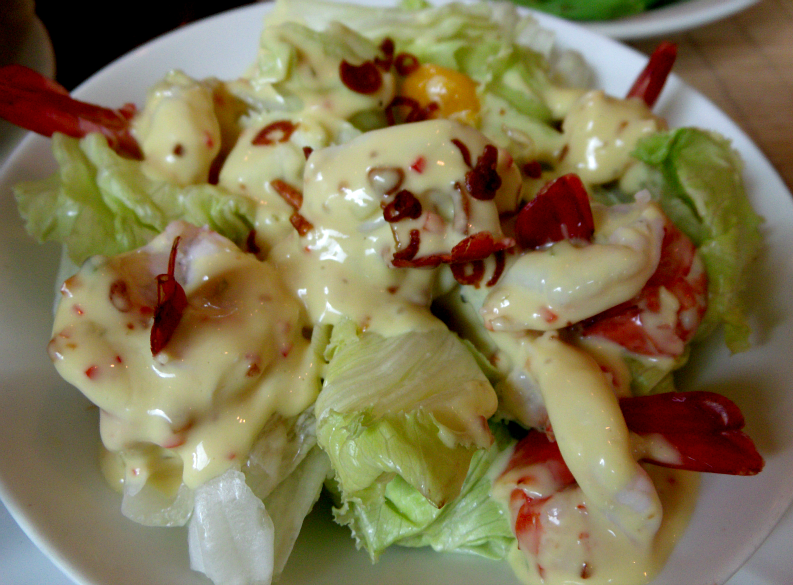 Description from their menu: Boiled shrimps with ripe mango balls on top of beds of organic Lolla Rossa lettuce and Iceberg lettuce dressed with french vinaigrette. My dad's a big fan of the greens and he picked this one. I love that the salad is generously covered with the dressing! The lettuce was indeed fresh because it was crispy and still a bright shade of green. I read online that Paradiso Terrestre has their own garden in which they grow their vegetables organically. Hmm, that's why! Also, I really love anything with mango. Served with green mangoes and shrimp paste. 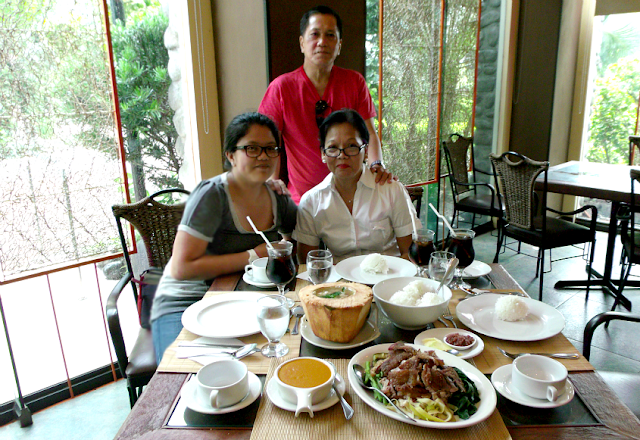 Of course we didn't miss the chance to order the star of the show, Crispy Kare Kare! We can't help but grin when this was served because the serving was huge. When I was young, my grandma used to always cook Kare Kareng Lengua and I remember not always eating it. Hehe. Because first, I don't really like lengua and second, I was always bothered with what are the components of Kare Kare because all I could see is the peanut sauce. So I really like presentations like this (same with Casa Reyes and Kanin Club) because I actually know what I'm eating and the quality of the meat and vegetables are not compromised since it's not sitting in all that sauce. Absolutely loved it. 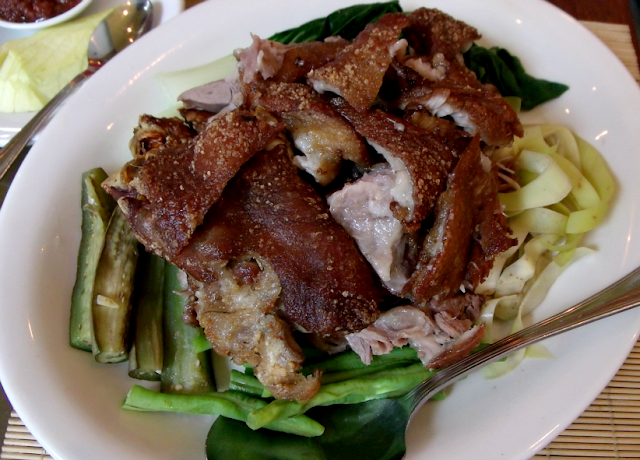 The crispy pata is of course true to its name, perfectly crispy, and tender. Peanut sauce was so creamy, can't help but pour some on my rice together with bagoong. Yum-uh-my. I can't get enough. And when you feel you have too much pork in your system already, you can always dip the green mangoes in the shrimp paste to cleanse your palate a bit. Hehehe. Pork lovers or not, you should try this one. Via Romana certainly knows how to end a great meal in an even greater way. How can you not fall in love with this? Seriously. 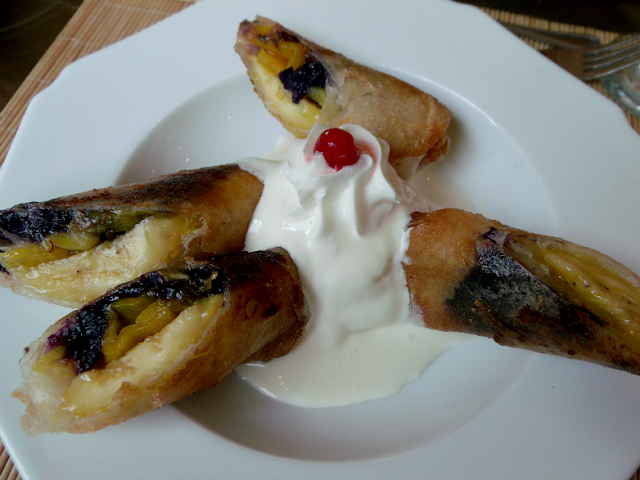 This is the best turon I ever had in my entire existence. Such a soft and intricate combination of sliced bananas, jackfruit and purple yam, all inside a perfectly fried lumpia wrapper. It was really delicious. Not too sweet and you can individually taste the different fruit fillings in every bite. It was such a treat, the delicate crunch at first bite, the soft filling and the fruity sweetness of this dessert. As if all of that wasn't enough, they put a scoop of what I believe to be manticado-flavored ice cream right in the middle. My sweet tooth is rejoicing! I will certainly come back to Via Romana just for this. It's always such a joy for me discovering new places and trying it for the first time with my family. There's always this certain kind of satisfaction I feel when I get to spend wonderful time with them. And it certainly was no mistake celebrating Mothers' Day in Via Romana. Great place, great food and very good service (kudos to the waiter who was running a one-man team yesterday)! This place deserves to be known by more people. For Via Romana's full menu, click here.